A screenshot of the author’s Twitter profile as shown on a computer screen, taken on 3/27/2018. Twitter is a social media platform with 330 million active monthly users as of 2017 for sharing posts of up to 280 characters–as of November 2017; prior to November, the character limit was 140 characters–that can also include images, links to articles, and short video clips. Twitter is useful for health departments because it is low cost. Unlike running an ad in a newspaper or on the radio–there is no cost to share a post (called “Tweeting”), reply or share other users’ posts (called “Retweeting”), or like or otherwise engage with Tweets. The only costs are staff time and resources dedicated to creating the content to post, posting the content, engaging with the Twitter audience, and to post paid advertisements on Twitter. Health departments can use Twitter as part of their overall communications strategy, participating in or hosting Twitter chats, to research barriers to accessing programs or services or to meet Public Health Accreditation Board (PHAB) standards and measures. Some health departments (approximately 217 as of 2012)(1) use Twitter as part of their communications strategy. They communicate information with the community, the media, and other partner organizations and stakeholders about public health issues, health education topics, current public health related events like health fairs or an ongoing community health assessment, and other related topics. When using Twitter as part of a communications strategy often in conjunction with using other forms of social media, it is important to keep in mind adapting the message for the format (240 characters with option to add photos and video clips) and audience using Twitter, which is slightly different than other social media platforms. Also the time of day when the target audience will be active on Twitter is important to consider since that time of day may not coincide with the hours the person managing the health department’s Twitter account will be at work and posting on the Twitter account. One way to handle this is by scheduling posts using an online social media manager like Hootsuite or Buffer. Whichever social media management system is used, it should include a way to schedule posts for each type of social media account, including Twitter, and not just one post with the exact same wording pushed to all social media accounts. While social media like Facebook and Instagram can handle long posts, Twitter posts are limited to 240 characters, so these posts need to be short and sweet and leave room for a couple hashtags. Also, while the posts may be scheduled to be posted at optimal times for when the health department’s target audience is on Twitter, it is still important to have someone engaging with the audience on the platform by liking, responding to comments, and retweeting posts during that time, which may be outside of normal working hours. Some social media management agencies who have some staff with a background in both social media management and public health or a public health focused consulting agency might be able to assist a health department with managing their social media presence including Twitter. 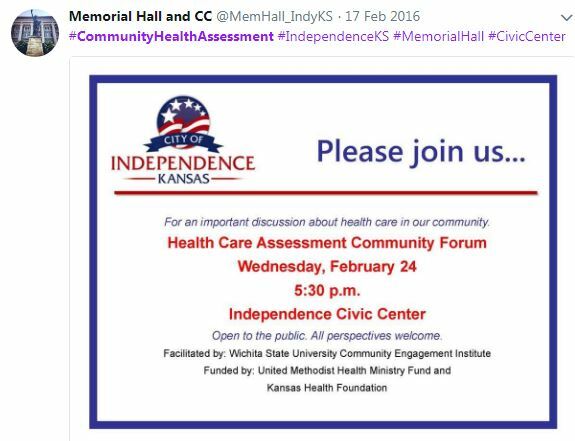 A screenshot of a Tweet announcing a community health assessment (CHA) meeting, screenshot taken in 3/2018. Hosting or participating in Twitter chats — scheduled conversations on a certain topic or event– is another way of using Twitter to communicate and engage with an audience on the platform. Twitter can also be used for researching barriers to participating in programs or services by searching specific hashtags in a local area. For example a recent study examined the barriers to CPR training in Pennsylvania using four years of Twitter data. The barriers were found to be time, duration, and location of the training. (3) A similar method might be able to be used by a health department or a research organization or consulting agency in partnership with the health department to find barriers to attending or participating in the health department’s services and programs. 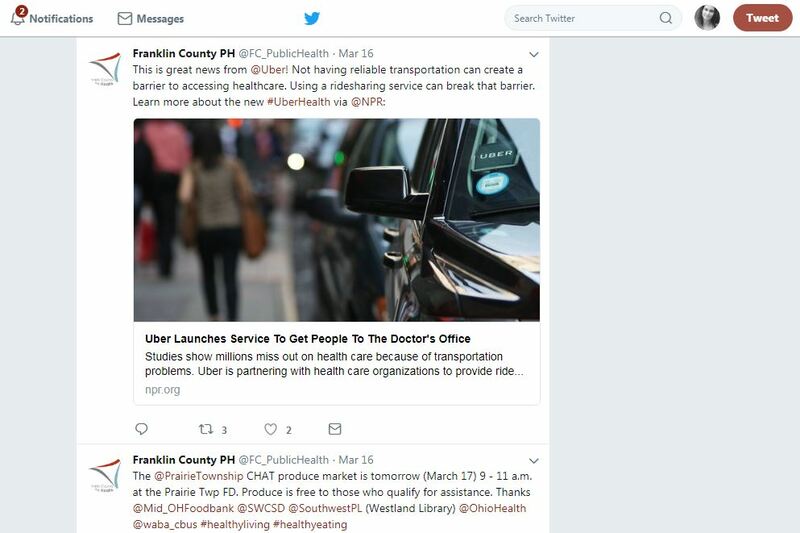 A screenshot of Franklin County Health Department’s Twitter feed, taken in 3/2018. Some health departments were early adopters of using Twitter, starting to use the platform in 2009(1), while others have only begun to use it more recently to use it or are just now considering using it. As more health departments are becoming Public Health Accreditation Board (PHAB) accredited or are in the process of PHAB accreditation or getting reaccredited, they are incorporating social media usage, such as Twitter as well as other social media platforms like Facebook, into their communications strategy to meet PHAB standards and measures in domains, such as Domain 3 (Inform and educate about public health issues and functions). 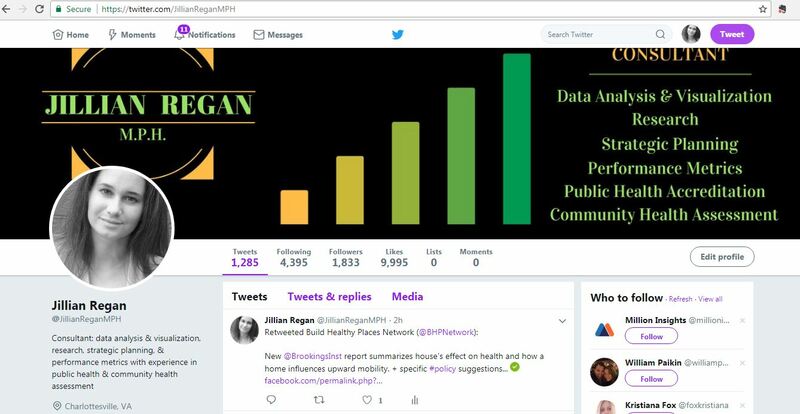 Depending on how the health department uses Twitter, its Twitter strategy and usage could be used as examples to meet other measures in other domains such as Domain 4 (engage with the community to identify and address health problems). 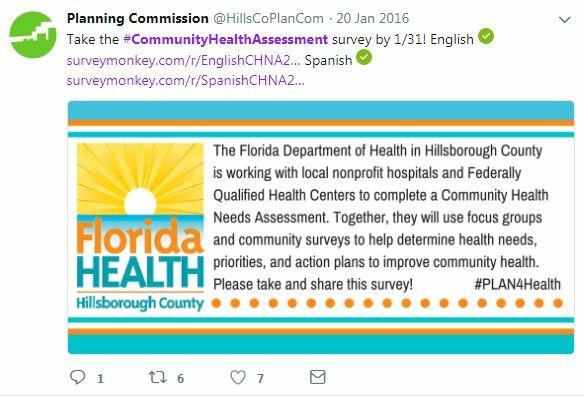 Some health departments have even used Twitter in their community health assessment (CHA) and/or community health improvement (CHIP) process — tweeting links to an online survey as part of the CHA or letting people know about and inviting them to their CHA or CHIP meetings. A screenshot of a Tweet including a link to a CHA survey, screenshot taken in 3/2018. Sharing information on Twitter can also make it easy for the health department’s partner organizations and other stakeholders who may be involved in the CHA / CHIP or are partners for other health department programs to share their message by simply clicking the button below the post to like and another to “retweet” it. A screenshot of tweets about the hashtag #communityhealthassessment, screenshot taken in March 2018. As more health departments use or are thinking of starting to use Twitter, it is important to measure and track metrics related to Twitter usage. Tracking metrics and results is a way that the health department can know if the resources they have put into using Twitter are getting the desired results. Also, tracking metrics for engagement is important, not just of how many tweets they post or retweet a month, but how many followers they have and how engaged those followers are with the content the post, such as the number of likes, replies, and retweets the Tweets get. Tracking the results, as well as measuring if there’s any difference over time or for tracking a specific health promotion campaign can also provide valuable insights into how the health department can improve their Twitter usage to communicate with their target audience. Having a PIO role is also one of the requirements for PHAB accreditation (PHAB measure 3.3). Although, as noted in the cited study, determining the locality of Twitter users is not very precise, due to many individuals using Twitter not including location information on their Twitter profile pages, whereas most Twitter accounts for businesses and organizations do include location information in their profiles. Health departments can use Twitter as part of their overall communications strategy to engage with their audience, participating in or hosting Twitter chats, to research barriers to accessing programs or services or to meet Public Health Accreditation Board (PHAB) standards and measures. Do you know of a health department who’s active on Twitter? How do they use Twitter, do they post content, or participate in Twitter chats, or use Twitter for researching barriers or do they use it in another way? Share in the comments below!